According to Wiktionary, an Architect is: “A person who plans, devises or contrives the achievement of a desired result.” Because the backplane is the key component in any system architecture, the sooner you consider the backplane’s physical architecture near the beginning of a project, the more successful the project will be. If you think about it in the same way as designing a building, you would never consider building it without first engaging a building architect to plan and oversee the detailed design. 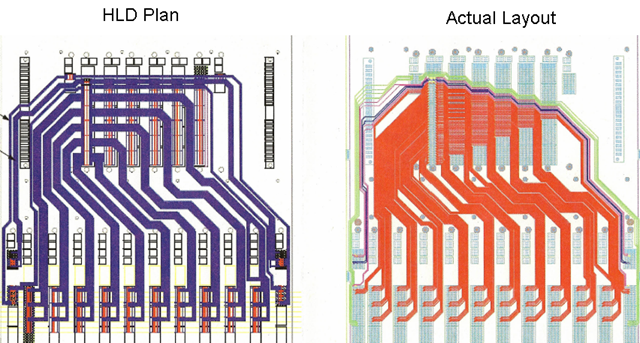 Likewise, the backplane architect plans and oversees the physical backplane design before any layout is ever started. He or she works closely with a system-packaging engineer to satisfy the system requirements before any concept becomes final. Sometimes the original system architecture needs revisions due to physical limitations the backplane imposes. This can only be established with due diligence and planning during the high-level design stage. Unlike other circuit pack designs used in the system, the backplane is much like the keel of a ship of which the rest of the ship’s construction depends on for support and structural integrity throughout its lifetime. Backplanes need to be right the first time so that circuit packs can interoperate together day one and be capable of supporting future system upgrades as technology advances. Once the system has been deployed into the field, it is next to impossible to change the backplane to correct any deficiencies or to upgrade for performance like you can by redesigning the plug-in circuit packs. The seasoned backplane architect is a unique individual usually tasked to turn the system architect’s ideas and dreams, like the system block diagram example shown to the left, into reality. An often-misunderstood profession, backplane architects wear many hats to accomplish their goals. Often they must juggle the design requirements from many disciplines and decide on the best trade-offs for the final design. They must converse fluently with system architects, mechanical designers, circuit pack designers, connector suppliers, PCB layout designers, ASIC/FPGA and software engineers. They must be organized and meticulous in their documentation and design. But, most importantly, they must have a sound knowledge of mechanical, PCB layout/fabrication, signal integrity, power and EMC issues. The greatest danger in leaving the backplane design as an afterthought is the connector selection and pin-out definition. If left to system packaging engineers and board designers to define, they may not be optimum for either performance or system cost. Many times system architects and packaging engineers will merely take the total number of signals and choose a connector with the highest pin density per inch without considering PCB routing or signal integrity implications. Inefficient routing of the traces leads to an increase in layer count and results in a thicker board. Thicker boards leads to higher hole aspect ratios and longer vias affecting high speed performance. Additional layer count impacts common equipment cost. Defines the final selection of appropriate connectors. Defines the connector signal partitioning and circuit pack pin-outs. Provides the routing plan and design rules for layout. Defines the net topologies for signal integrity analysis and link budgeting. Facilitates the mechanical design of shelf and system packaging. Defines the minimum slot pitch for optimum routing channels. Facilitates early circuit pack floor planning and final card size. Facilitates ASIC and FPGA pin selection for optimum routing to backplane connectors. Estimates PCB layer count and board thickness. Establishes an estimate for system cost of goods to support the business case. Proper route planning and connector pin-out definition is vital for optimum performance. When done correctly, the final schematic capture and actual PCB layout will flow smoothly with no surprises. As an example, the left half of the figure (labeled HLD Plan) shows a sample of an inner layer high-level design route plan I did using Framemaker as the drawing tool on a design before any schematic was ever captured or pin-outs defined. Everything was planned from the number of layers to how the tracks needed to break out of the connector fields. The right half of the figure is the actual layout done in Cadence Allegro showing the inner layer routing of the artwork. The due diligence done in the high-level design stage made the actual layout fairly trivial. If you forgo this step, the worst-case scenario is the project will need to be reset to redesign shelf mechanicals or redefine card pin-outs causing delay in meeting time to market objectives and ballooning R&D costs. It’s a classic case of pay me now or pay me later. At Lamsim Enterprises Inc., we can help you with these or any other design challenges you may have by providing innovative signal integrity and backplane solutions. Visit us at our web site at: lamsimenterprises.com . A midplane is similar to a backplane in function except that the circuit packs plug into both sides of the shelf assembly. In these systems, cards with I/O cabling from the faceplate plug into one side of the shelf, while non-I/O circuit pack plug in on the other side. Some midplane architectures have the front card plugged in orthogonally to the rear cards for high speed applications. Parallel bus topologies carry data words in parallel on multiple traces from card-slot to card-slot across a backplane or from chip to chip on a circuit pack. Up until the late 1990’s, most system architectures used this form of interconnect. Due to signal integrity and timing issues associated with some parallel bus architectures with 10 to 16 card slots, the speed of the bus was limited to 25-66 MHz Two popular industry standard systems still using parallel busses today are CompactPCI and VMEbus. The main issue with a parallel bus topology is fault tolerance where a single point of failure on the bus can bring down the entire system. Mission critical systems often had to employ redundant busses to guard against single point failures. 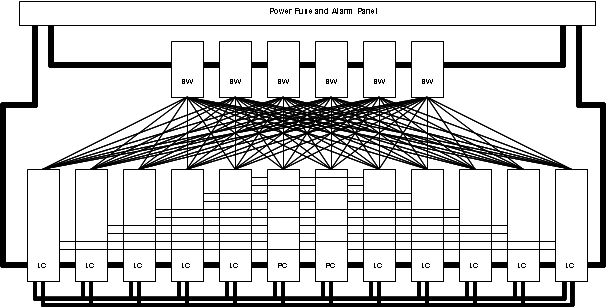 As performance demand increased, newer high speed system architectures were designed using serial technology in a point-to-point or point-to-multi-point switched fabric topologies. Switched fabric, or just plain fabric, is the term most popular used in telecommunications and high-speed networks, including InfiniBand, Fiber Channel, PCIe, ATCA and other proprietary fabric based architectures. In these architectures, all data passes through the fabric before continuing to its destination. It offers better total throughput than parallel busses because traffic is spread across multiple physical links. It manages and controls all functions of the network and acts as a repeater for the data flow. Star topologies are one of the most common high-speed serial topologies used in networks today. The advantage is it reduces the chance of network failure by connecting all of the systems to a central node. A failure of a link from any peripheral node to the central node results in the isolation of that peripheral node from all others. As a result, the rest of the systems remain unaffected. In its simplest form, a single star topology consists of one central hub node interconnected point-to-point to other peripheral nodes resembling a spoke wheel or star configuration. When implemented in a backplane, the central node is usually the switched fabric card and the peripheral nodes are line cards. The fabric card switches messages between the other line cards in the network. The line cards usually have faceplate I/O connectors to connect to other shelves in a network. The main disadvantage with a single star topology is high dependence of the system on the functioning of the central fabric. Failure of the fabric card can bring down the entire system. Because of this, mission critical systems employ two fabric cards for redundancy in a dual star topology configuration. The dual star or multi-star topology is similar to the star network topology except it has two or more central hub nodes interconnected point-to-point to other peripheral nodes. When implemented in a backplane application, these central nodes are usually the switched fabric cards and peripheral nodes are the line cards. The additional fabric(s) provides redundancy in mission critical system applications in case of failure, or for upgrading fabric card hardware. A fully connected mesh topology, when applied to a backplane application, does not have one central fabric node(s) as in the case of star topologies. Instead, each line card node connects with all other line card nodes forming a mesh. Its major disadvantage is the number of connections grows significantly with the number of nodes. This requires additional backplane connector pins and layers to interconnect them. Because of this, it is impractical for large systems and only used when there are a small number of cards needing to be interconnected. The information about Backplane Architecture is something to smile about. It elaborates what for many days has not been explained. I agree that the backplane is the key component in any system architecture and the sooner you consider the backplane’s physical architecture near the beginning of a project, the more successful the project will be. Many people don’t know this neither have they heard about it. The importance of the high-level design is quite important.